You want first page rankings – I want to know why is a boxing ring square? OK, it’s not very English (for that is what I am), but let’s talk about money. Now before you scroll down and say “Great Scott, Blend are expensive” there is something you should know. Most clients that end up working with us have had their fingers burnt chasing “affordable SEO” or “cheap SEO company”. In fact, we have worked with numerous clients that have wasted years and tens of thousands of dollars jumping from one SEO agency to another trying to make ‘online’ work. All this does is waste your valuable time and burn your hard-earned money. It’s time to break the cycle, are you ready? Cheap SEO is Always the Most Expensive! In fact, cheap SEO is like getting mail order braces. Sure, you’ll get movement on your teeth, but not in the safe and predictive way only a board-certified orthodontist can guarantee. An orthodontic specialist will align your bite and create a beautiful, healthy smile. With DIY braces, you’ll not only have discomfort and your health issues compounded but also the additional time and expense of having to pay a professional to fix the mess you made. As with most things, you only get what you paid for. So stop throwing away $200 or $300 per month on SEO garbage and do it properly. Why, because you’re worth it! For the hourly rate of $150 p/h you get a dedicated team of professionals with extensive knowledge and experience in Website Design & Development, Local SEO, Digital & Content Marketing, Google My Business and Reputation Management. We no longer offer ‘Social media services’ but we can set everything up for you to do yourself. You really shouldn’t be paying an agency to do this for you. We have been doing what we do since 2008, constantly learning and evolving along with the search engines and our industry. We are not SEO experts of gurus. If anyone says they are, run a mile! 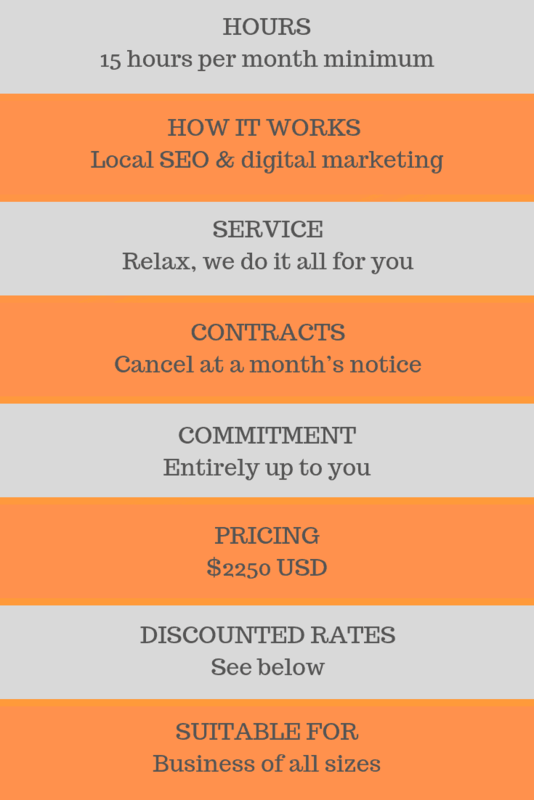 For recurring monthly paying clients, our hourly rate is $150USD. However, if you commit to a long-term campaign, we offer generous discounts. Of course, SEO takes time to start seeing results, so it makes sense to consider the following options rather than just paying month to month. All campaigns run at a minimum of 15 hours per month. Otherwise your campaigns will take forever and that’s a mighty long time! From experience, 15 hours per month is enough time to get a reasonable amount of work done (at a bare minimum). Of course, if you want to fast track, you can choose to allocate more hours per month (even at the discounted rates), which many of our clients do once they see the amount of work that we do and the results we generate. Obviously, the more time we dedicate to your SEO campaign, the faster you will see results and generate a healthy ROI. We do the job the RIGHT way, that is why we charge what we do and provide a high-quality service. We are not interested in having hundreds of clients or are in the churn and burn kind of SEO business model you’ve probably encountered before. We only want to partner with committed high-quality orthodontic clients who understand that great SEO is an investment for the future success of their business. If you are currently working with a SEO company and you’re only paying a few hundred dollars a month and have no idea what you are paying for, then the chances are you’re being rolled. If you have read this far, you already know that, right! Contact us now and let’s work together and start to get the results you’re really after.